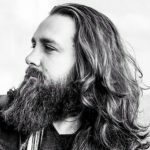 World Poetry Celebrates Musician Jeff Denson! The World Poetry Café Radio CFRO 100.5 FM , August 23, 2018. 1-2 PM PST, celebrated its 20 year on the air this year with a new segment in Living Memory for Dr. Warren Stevenson and a tribute written by his daughters. 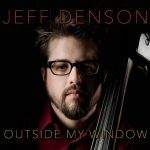 A unique, talented musician and educator Jeff Densen joined us at 1:30 PM,PST with his new CD, Outside my Window . Subscribe to his newsletter and receive a demo at www.jeffdenson.com *Courtesy of Braithwaite and Katz. I love this CD, it is powerful, haunting and enjoyable. The Team: Co-host Jaqueline Maire and host Ariadne Sawyer, super tech Victor Schwartzman and special volunteer Sharon Rowe with her Big Bessie Story, read by Victor. Another talented award winning poet from the Lincoln Club: Jane Rowland with her lyrical poem, Simple Courtship was read on the show. CLICK HERE TO LISTEN TO THE RADIO SHOW! *Biography written by Mark Thompson. This entry was posted in Ariadne's Notes, E-Poets, Featured musicians and artists., Featured Poets, General and tagged Author Sharon Rowe, Braitwaite and Katz, Dr Warren Stevenson, International Peace Award Ariadne Sawyer, Jacqueline Maire, Jane Rowland, Jeff Denson, Victor Schwartzman on August 26, 2018 by Ariadne. World Poetry Celebrates Dr. Warren Stevenson! 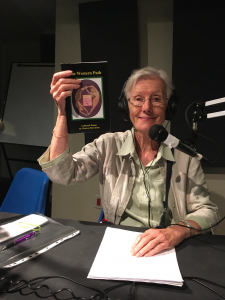 Co-host Jaqueline Maire with one of Warren’s books. 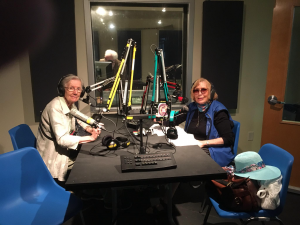 The World Poetry Café Radio CFRO 100.5 FM , August 23, 2018. 1-2 PM PST, celebrated its 20 year on the air with a new segment in Living Memory . We welcomed the new series with a wonderful tribute to Dr. Warren Stevenson written by his two daughters. Co-host Jaqueline Maire and host Ariadne Sawyer, super tech Victor Schwartzman and special volunteer Sharon Rowe with her Big Bessie Story, read by Victor. Also a wonderful musician Jeff Densen with his new CD, Outside my Window He will have his own feature next. Subscribe to his newsletter and receive a demo at www.jeffdenson.com Courtesy of Braithwaite and Katz. Another talented award winning poet from the Lincoln Club, Jane Rowland with her lyrical poem: A Simple Courtship. We will read her second poem next week, Prayer to My Unborn Child. Warren Stevenson was born in Hamilton Ontario in 1933. His mother divorced his musician father when Warren was young and enrolled him a year early in Hillfield School in his home town. He skipped another year at school, and a scholarship allowed him to do grade thirteen at Toronto’s Upper Canada College. Scholarship and fatherhood were the constants of his life for the next many decades, as he and Mary, who was a school teacher and homemaker, had five children. 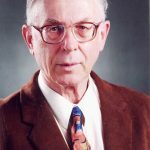 After starting teaching in Manitoba, Warren spent the rest of his career teaching in the UBC English Department, publishing six books of literary criticism on the Romantic poets, as well as several volumes of his own poetry. He continued writing poetry well into retirement, as well as a lively pen pal relationship with Margaret Atwood. Retirement also meant a chance to read for his own pleasure, see many movies and plays, collect artwork, and also, of course, continue with his poetry-writing and his participation in the World Poetry Association’s events and comradeship. Warren is now a live wire in a wheelchair in a care home. And while he continues to be known there as “The Professor”, his memory and cognition have, like his body, suffered the slings and arrows of time and degeneration. But being a poet at heart, he can find joy and beauty in the small things, like the smell of a rose, or feeding and apple to the resident horse, aptly named “Beau” which had been Warren’s childhood nickname. Note: Warren was ahead of his time with his interest in the myth of androgyny. One of his academic books he published is called Romanticism and the Androgynous Sublime Revisited A New Perspective of the English Romantic Poets in which he studies that theme in the works of Blake, Wordsworth, Coleridge, Byron Shelly and Keats. *Tribute by his two daughters. 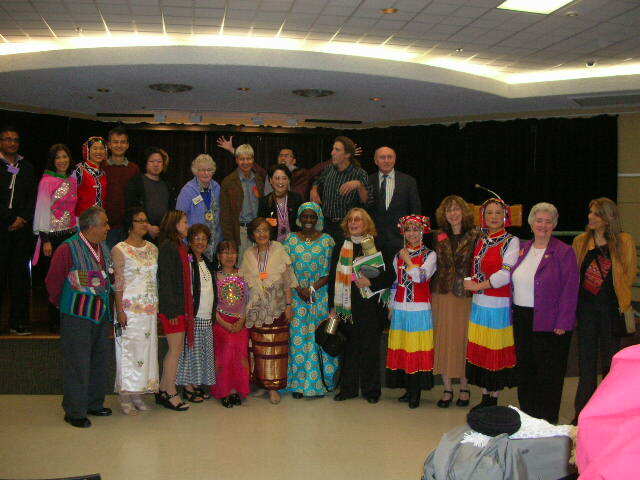 Book: The Western Path, Collected Poems by Dr. Warren Stevenson , Publisher: Multicultural Books of BC. This entry was posted in Ariadne's Notes, E-Poets, Featured musicians and artists., Featured Poets, General and tagged Braitwaite and Katz, Dr Warren Stevenson, Jane Rowland, Jeff Denson, Lincoln Poetry Club, Outside My Window, Victor Schwartzman on August 25, 2018 by Ariadne. 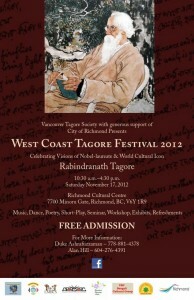 World Poetry BC , Canada Events for November and December! 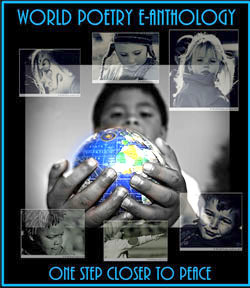 Ariadne’s notes: This is the World Poetry BC event calendar for November and early December 2012. Exciting news! our visitor count for today is 1,823 thanks to Yaman! For the first time we are featuring a community partner event on this site. 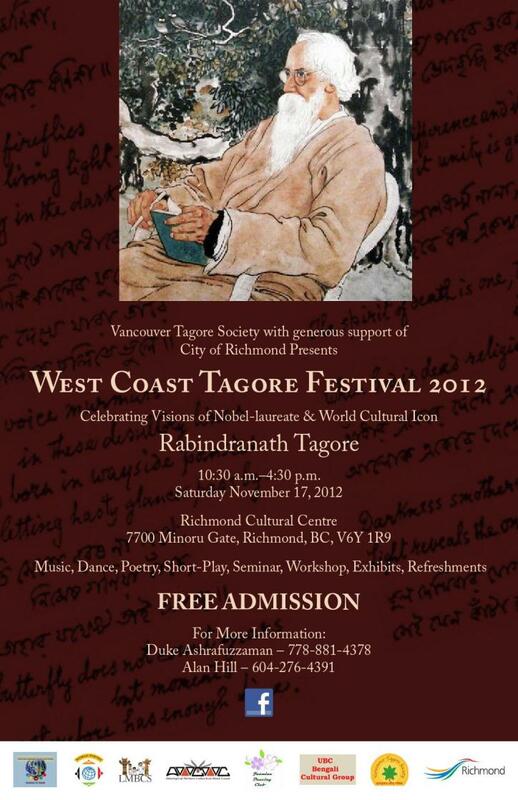 The Vancouver Tagore Society has been an ethical partner and we are pleased to share their poster. Saturday, November 24, World Poetry Youth Team Celebration,1-3pm, Lillooet room , Irving K. Barber Learning Centre, University of British Columbia, 1961 East Mall Vancouver, BC V6T 1Z1, www.ikebarberlearningcentre.ubc.ca/ World Poetry Youth Team Hosts: Yilin Wang, World Poetry Youth Team Leader and Anita Aguirre Nieveras, MA, Educator and professor, author of several books. Features: Israel Mota, poet, actor and musician, Spanish host of the World Poetry Cafe Radio Show Jeremie Marion, Métis poet. Dr Warren Stevenson, Professor Emeritus of Romantic Literature at UBC Manolis Aligizakis, English and Greek, author and publisher. Open mike. Workshop: Creative Dreaming Tools for Your Art. Use creative dreaming tools including day dreaming interactive workshop to enhance your creative work and bring forth new talents and abilities. Poets writers, musicians, dancers and film writers will benefit from this workshop. Ariadne Sawyer MA, Creative Consultant has worked with poets, novelists, artists, musicians , filmmakers and writers to achieve their creative goals in classes, workshops and individual work. 30 minutes, handouts included. Please register early to ensure a space. Donations for World Poetry gratefully accepted. Wednesday, November 28 World Poetry Night Out, “Sharing the Holidays Celebration!” Bring a story about a holiday/tradition that you have experienced , a poem and food (from your tradition or country). Hosts: Jemma Downes and Selene Bertelsen, Book exchange. Raffle. Open mike. Please request a featured spot early at ariadnes@uniserve.com.New Westminster Public Library (our honoured partners), 716 6th Avenue. New Westminster, BC. 4th Wednesday of each month, 6:30 pm. Featured poets. Special events, open mike. book raffle, refreshments, free, all are welcome. 604-526-4729. * No event in December. This entry was posted in Ariadne's Notes, Featured Poets, General, Ongoing World Poetry Events, World Poetry New Westminster, World Poetry Youth Team and tagged Anita Aguirre Nieveras, Ariadne Sawyer, Bernice Lever, Creative Dreaming Tools, Dr Warren Stevenson, Farina Reinprecht, jemma Downes, Jeremie Marion, Koyali Berman, Manolis Aligizakis, Poets Across Borders, Selene Bertelson, West Coast Vancouver Tagore Festival, Yilin Wang on November 15, 2012 by Ariadne.